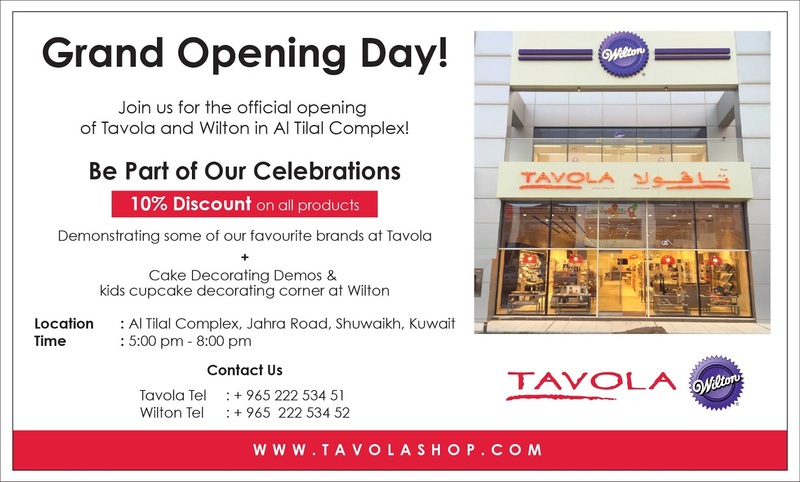 Just wanted to share with all my Kuwait readers that Tavola is opening a second store at the Al Tilal Complex in Shuwaikh [map here]. The grand opening will be this Saturday, the 1st of October from 5pm to 8pm and they'll be having a 10% off sale on absolutely everything in the store. There will also be a few demos and a cupcake decorating corner for kids, sounds interesting! Though I don't bake as much as I used to, Tavola is hands down my favourite store to browse in. You get incredibly inspired just by looking at all the bakeware and decorating tools and I can easily spend the good part of a few hours inside! Their collection of Wilton products is pretty extensive too and is my go to place for gel icing colours. I do wonder why they opened their second branch not far from the first and would have preferred a store nearer to Salmiya. Hopefully one day. You can find their website [here] and they also have a shop online feature with free delivery for orders above 30KD! The old store has closed down, so there's just the one store in Kuwait. They're hoping to open two more branches, one in Salmiya and the other in or around Fahaheel. Tavola had initially tried to open a branch at the Boulevard in Salmiya, but unfortunately it wasn't meant to be. That's a pity as the Boulevard is just a stone's throw away for me!